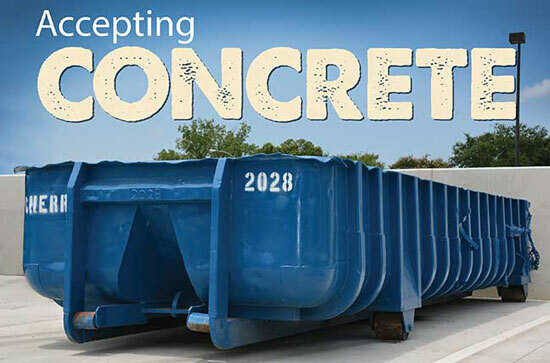 August 6, 2014 -- Mayor Annise D. Parker announced today that the City’s six Neighborhood Depository and Recycling Centers will begin accepting concrete for recycling. The addition of concrete recycling highlights the City’s continued efforts to mine valuable commodities from the waste stream and save natural resources by using material already in existence. “Not only is Houston saving the cost of dumping this heavy material but by partnering with The Cherry Company we are saving resources by reusing a product that already exists and returning it to the market for local projects,” said Mayor Parker. “Houston home owners tearing out sidewalks or patios are now able to help the City save landfill fees by recycling those chunks of concrete. Residents can drop off the material at no cost at one of the City’s six Neighborhood Depository and Recycling Centers and rest assured The Cherry Company will put the material to good reuse,” said Sarah Mason, Solid Waste Management Department Senior Environmental Analyst. The recycled concrete is a valuable resource and is used in erosion control, parking lots, and as an underlayment for new roadways and highways. The Cherry Company was ranked as the seventh largest demolition company in the Unites States in 2014 and currently recycles over 2 million tons of concrete annually. The company returns 100% of the recycled concrete aggregate product into new construction, local maintenance and repair projects. Houston residents may use the depositories up to four times per month. Citizens are encouraged to arrive at least 30 minutes before closing time to allow adequate time to unload. Each user must provide a Texas Driver's License or ID and a current utility bill or city property tax receipt as proof of residency. The Solid Waste Management Department provides solid waste services to the residents of Houston through the collection, disposal and recycling of discarded material in a manner that is safe, efficient, environmentally sound and cost-effective. For more information about the City of Houston Solid Waste Management Department and its services, please log on to www.houstonsolidwaste.org, follow us on twitter @houstontrash or like us on facebook at https://www.facebook.com/houstonsolidwaste. Cherry is a recycling company based in Houston, Texas. Family owned and operated since 1952, Cherry specializes in the removal of all types of structures. In addition, Cherry’s eight Houston area recycling centers produce a variety of grades of recycled products and deliver 99.6 percent completely recycled materials. Producing more than two million tons of concrete and asphalt and thousands of tons of steel every year, Cherry also recycles residential composition asphalt shingles and tires; making Cherry one of the largest recyclers in Texas and the Gulf Coast region. For more information, see www.cherrycompanies.com.